Biology professor Marc-Jan Gubbels studies the genetics and invasion techniques at the molecular level of Toxoplasma gondii, a protozoan parasite carried by cats that also afflicts humans. Although most people who acquire it remain asymptomatic, T. gondii can endanger fetuses and immunocompromised individuals, causing birth defects, encephalitis, and vision problems. This parasite is easily grown and manipulated in vitro, making it a versatile model for study—both on its own and as a surrogate for related parasites, among them malaria. 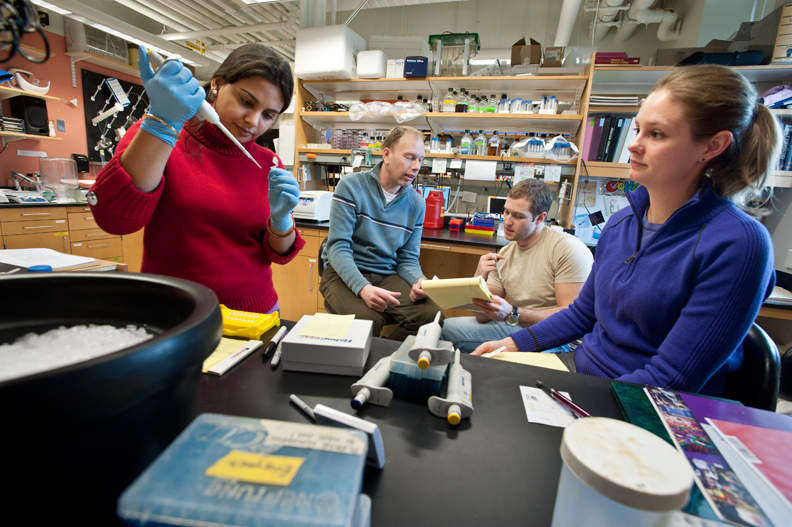 On January 4, Gubbels (center, left) worked in his Higgins Hall laboratory with doctoral students Rashmi Dubey and Brooke Anderson-White (foreground, left and right) and technician David Faugno-Fusci ’10. This feature was posted on Thursday, January 6, 2011 and is filed under Featured Photo.